Successfully Added Hard Drive Media Enclosure - Hi-Def DVR + Media Player to your Shopping Cart. 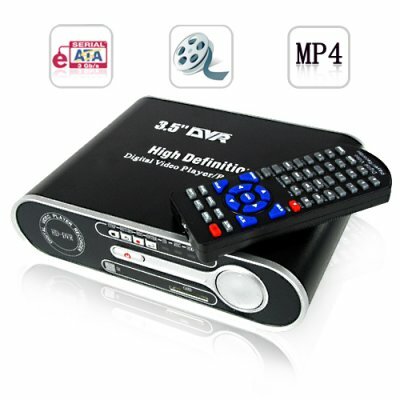 High definition digital media player, recorder, and portable storage with built in SD card reader + multiple AV connections. Have you shopped the local electronics superstores and been impressed with the digital video player and recorders but been put off by the cost? Well, we have the perfect answer for you - this high definition SATA hard disk drive (HDD) enclosure with built-in media recording and playback. All you need to do is install the SATA HDD of your choice and you are ready for hours of entertainment, all at a very affordable price and without the need for expensive monthly subscriptions. After installing a SATA hard disk drive the usage possibilities are practically endless, from backing up your photo albums, music library and video collection to providing yourself with hours of video watching entertainment on your TV - all with this one magical black box! Recording TV (or from other AV sources) is a snap too, with scheduling and instant recording available in a variety of quality presets so you can record your favorites in high quality and get the news with a lower quality to save on disk space. Then when there's nothing on television to watch you can browse everything on your new DVP/DVR easily with the remote. See something you like, then simply push play! And all from the comfort of your couch. Time shift is also a feature not to be missed - you can pause live TV to go check on dinner then come back and push play to watch the show from where you left off! Stop messing around with complicated computer based setups and grab one (or three) of these beauties! We continuously expand our HDD Media Player product selection to give you the greatest selection for resale, OEM, or company/personal use at direct wholesale prices. We make it easy with direct shipping and no M.O.Q (minimum order quantity), so when you think of HDD Media Enclosure, think of chinavasion.com! The hard disk drive you install in this unit must be formatted in FAT32 if you want to connect the unit to a TV for file browsing, the HDD can also include an NTFS partition for simple external disk storage (via USB). Therefore when using this unit as a stand-alone media unit we recommend formatting your entire disk in FAT32. Who needs an external HDD enclosure? Everyone! Backing up important data should be a priority for anyone living in the modern digital age. Additionally, transporting files in excess of 32 GBs is impossible for most USB drives and SD cards. This unit supports large capacity HDD devices so it is perfect for the modern digital home or office. on 2009-01-25 00:43:28 Great Product, lots of features. I bought this for one of my customers who wanted to record cable programmings for his daughter. H enow uses it to watch all of his downloaded content as well as the schedule recording of shows. I plan to buy lost more.